Burr elm veneer with black edging & butterflies inlay. Satin finish. 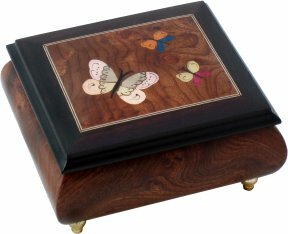 A beautifully crafted musical ring box finished in burr elm with butterflies inlaid marquetry. Lift the lid to reveal the plush lined interior with ring holder strip and play the musical movement. Wound from underneath, the movement can be hidden or on show by removing the velvet cover. 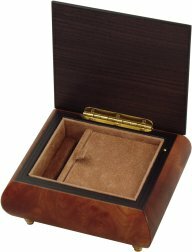 A beautiful music box for your special occasion. For more information on the musical movements used, please click here.